For about four decades, hybridoma technologies have been the “work horse” of monoclonal antibody production. These techniques proved to be robust and reliable, albeit laborious. Over the years, several major improvements have been introduced into the field, but yet, antibody production still requires many hours of labor and considerable resources. 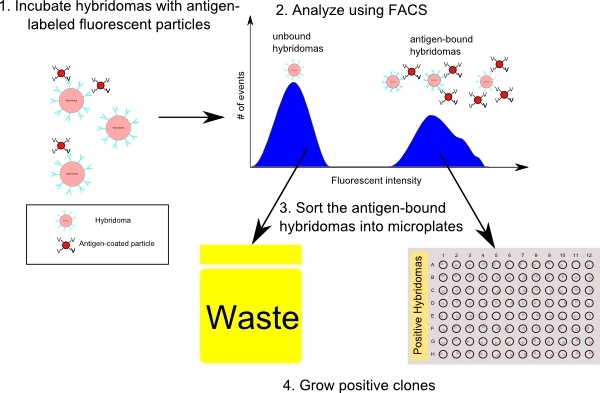 In this work, we present a leap forward in the advancement of hybridoma-based monoclonal antibody production, which saves labor and time and increases yield, by combining hybridoma technology, fluorescent particles and fluorescence-activated cell sorting (FACS). By taking advantage of the hybridomas’ cell-surface associated antibodies, we can differentiate between antigen-specific and non-specific cells, based on their ability to bind the particles. The speed and efficiency of antibody discovery, and subsequent cell cloning, are of high importance in the field of infectious diseases. Therefore, as a model system, we chose the protein LcrV, a major virulence factor of the plague pathogen Yersinia pestis, an important re-emerging pathogen and a possible bioterror agent.